Two pairs of socks in progress! Both Cookie A patterns, which is a bit unusual for me – while I love her patterns, some of them are a little more mentally intensive than others and so I don’t like to have two in progress at a time. That, and I generally don’t have more than one pair of socks in progress at a time, period. But I find both of these fairly intuitive, which helps a lot. Slide, on the right, is for me. 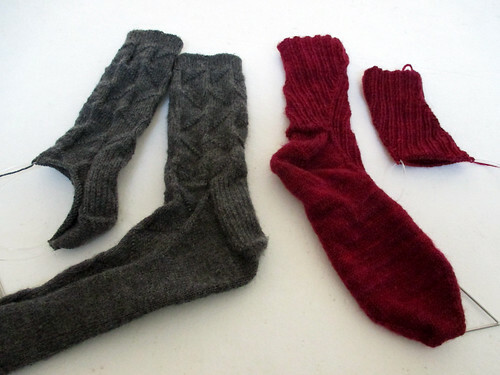 It’s in Mountain Colors Bearfoot, which I have used before (for Snicket), and it makes a lovely toasty house sock. Too thick for most of my shoes, but perfect for indoor lounging (and it even stands up nicely to our carpet, which, as I’ve mentioned before, is awful for socks). I’m hoping I get at least Cauchy done before the end of this month, partly so that it’ll be done before his birthday and partly because I’m about to start two time-sensitive projects that will take up all my April and May knitting time. Should be doable. Probably. This entry was posted in Knitting and tagged Cauchy, Slide. Bookmark the permalink.